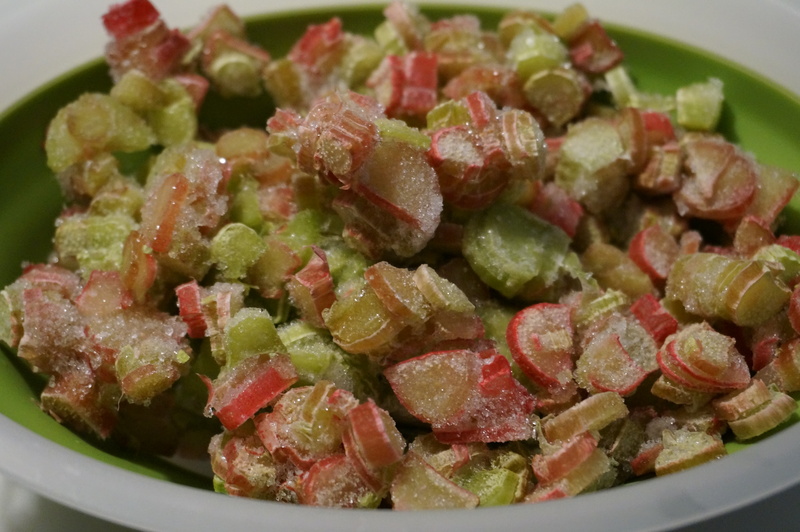 When I froze rhubarb last summer, I had no idea how happy I’d be to find it in the freezer during the winter that refuses to end. I had smartly cleaned and chopped the rhubarb, then portioned it into two plastic bags. If only I’d written the amounts on each bag. I vaguely remember thinking I would remember. Of course, I didn’t. Lesson learned. A quick search revealed this recipe for rhubarb blueberry muffins. Jackpot! I was intrigued that sour cream was on the ingredient list, I had frozen blueberries in the freezer that I’d bought but never used for smoothies, and I knew there was at least a cup of rhubarb. The muffins were moist and flavorful, and the recipe easily yielded 18 instead of an even dozen. When I have more rhubarb, I’ll make them again. As much as I believe community supported agriculture is important, I can’t say that I’m sad to see another CSA season come to end. I’d compare the experience to Christmas — come Thanksgiving, I can’t wait to put the tree up, but as soon as the holiday passes, I don’t even bother plugging in the lights every night. When fall hit, and we entered kale season, our enthusiasm waned. Thankfully, most of these veggies are ones that will keep for a bit in the crisper. Because honestly, that’s where most of them still are. And we’re back! 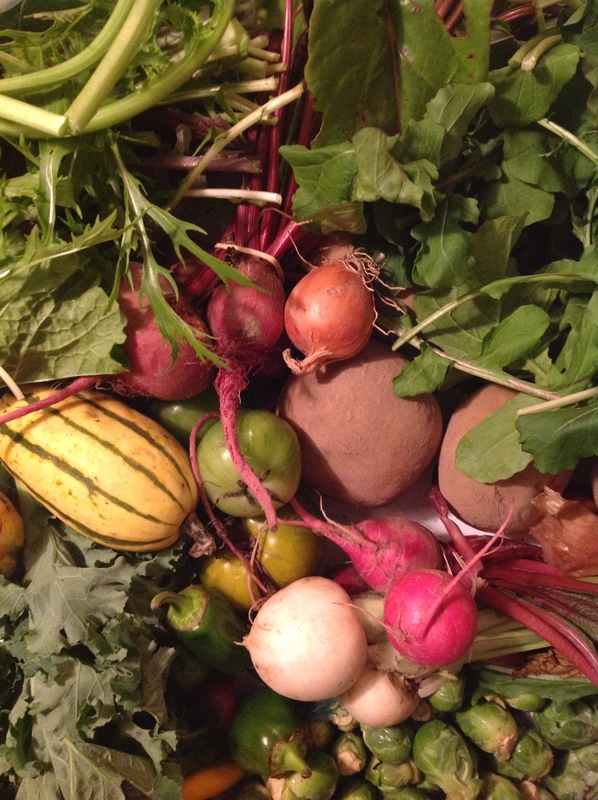 Huge thanks to Dana for picking up our CSA share for two weeks and blogging about it, even with spotty internet — AND a newish baby in the house. I picked up our veggies around noon yesterday and, since I had a slew of post-vacation errands to run, immediately came home and stuck them in the fridge. Unpacking the bag a day later may not have been the best idea, as a bundle of greens was way wilted. The bok choy is also less than crisp, so I’ll sauté that tonight in some oyster sauce. The kale will be this week’s biggest challenge. Kale was more than plentiful in last year’s CSA, and I never mastered cooking it — and Mike never mastered eating it. I’ve been dreading its appearance this season. Oh, well. Here we go. Another thing that’s a lot like last week is that my Internet access is again coming and going, with it going most of the day. Argh. Although, I can’t complain about the delicious stir-fry these vegetables yield, and I’m excited to add bok choy and broccoli to it. 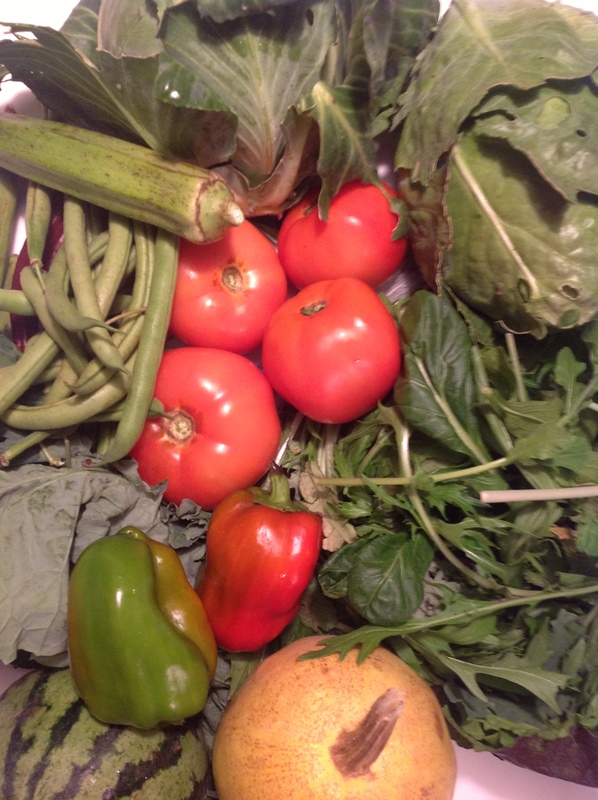 Once again, big thanks to Darci for sharing her CSA and allowing me to guest post here! My friend Dana is taking over the blog while Mike and I are in the UK. Take it away, Dana! Thanks, Darci! 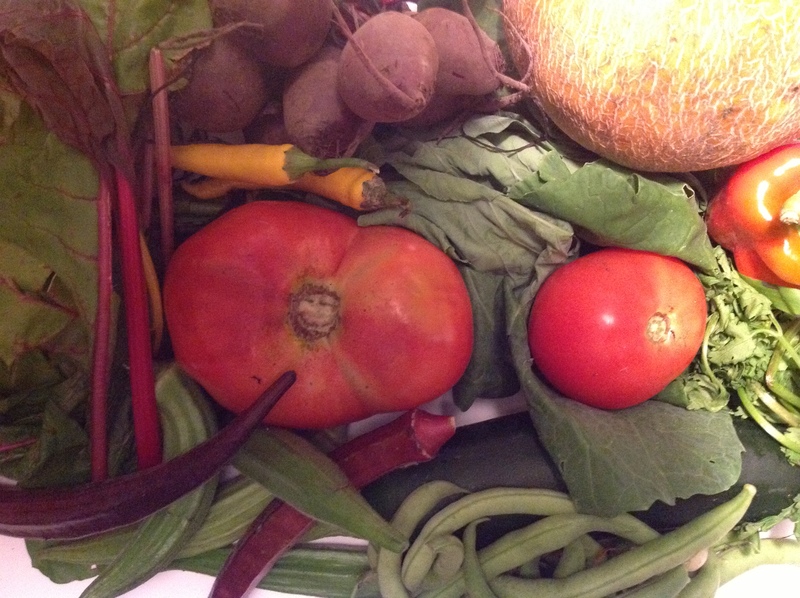 As you have probably already noticed this was last week’s CSA that I’m posting this morning. I apologize for the delay, but my Internet access was on the fritz all week due to some faulty wiring on the pole outside (or so says the nice man from Comcast that came to fix it). I had about five minutes a day of access. Not only did this mean posting here was problematic, but since I garner all my recipes online I had to go old school for this CSA. Being disconnected from the Internet has its advantages. I realized that I didn’t need to necessarily whip up something extraordinary because Darci had generously gifted me her CSA. We shop our local farmer’s market every week as locally grown produce is an important part of my family’s diet. 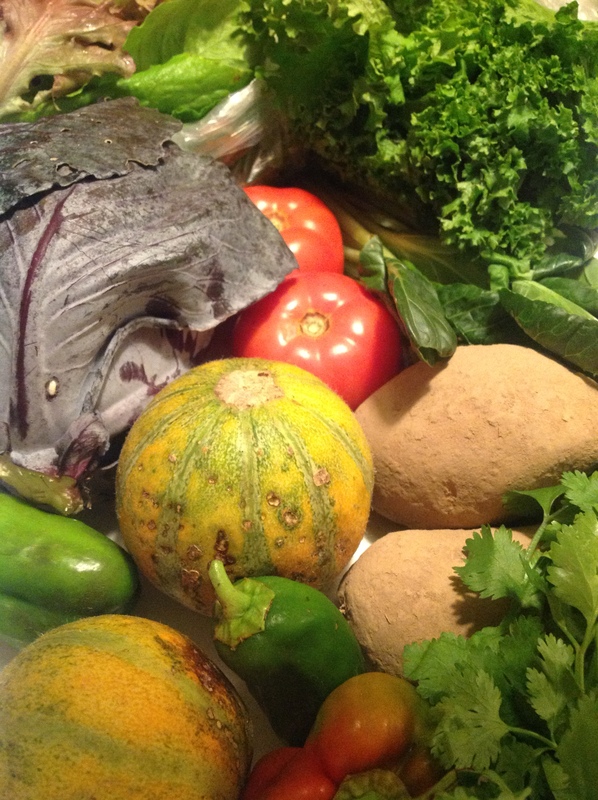 So I did what I normally do: I incorporated the CSA into our every day meals. Several salads were made utilizing the tomatoes, red peppers and radishes. The kale has been a staple of my daily morning smoothie (which is nothing more than the greens, some strawberries, bananas and almond milk). The green beans were a side dish for a purchased rotisserie chicken. The melon was a delightful breakfast treat for my kids. A stir-fry utilizing the remaining red paper and mixed chard was delicious and, again, simply prepared by sautéing with soy sauce. Finally, I roasted the pumpkin and baked some pumpkin spice muffins (the recipe for which I’m having trouble finding at the moment). This week, I remembered that having a CSA doesn’t have to be a stressful, “How will I use all those vegetables?” prospect. 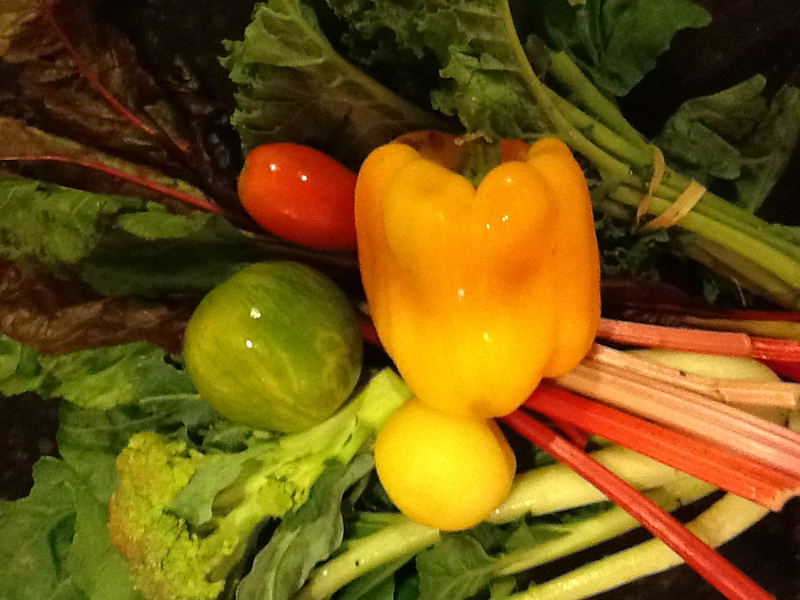 Too often with my prior CSA, I felt like I needed to get really creative because I had this special box of vegetables. This resulted in my spending a lot of time planning big cooking/baking projects and then wasting produce as time got away from me. I suffered from CSA anxiety. However, as I looked upon our bounty this past week I realized that I often buy most of these very same things at our market to do just what I did–eat a little bit local every day. Whew, anxiety alleviated. CSA, Hooray! Another weekend away resulted in beginning another week with an overwhelming amount of vegetables filling both crisper drawers. And since I had a ukelele lesson last night, and Mike walked in the door from work right before I got home, we threw together sandwiches at 8:30 p.m. I whipped up a beef, cabbage and carrot stir fry tonight, over Ramen noodles (again, no judging). I’m not sure why I’ve always bought shredded cabbage and carrots — the food processor got the job done in mere minutes. When I was at the butcher buying tenderloin tips, I also picked some mild Italian sausage. Okra is next on the hit list. Anyone have a tried-and-true recipe for gumbo? For whatever reason, I’m less enthused about this week’s CSA share than I’ve been about the others. I think I’m ready for the switch to fall vegetables (and sweaters!). But beets did make their debut. Mike loves beets, which I typically roast. But these are pretty small, and wrapping them all in foil seems like a pain. Looks like it’s time to employ my well-seasoned Googling skills. I stir-fried boneless, skinless chicken thighs tonight, so have already used the green and red peppers, the Swiss chard and the mystery leafy green. I still have no idea what that leafy green was, even after giving it a quick taste before tossing it in at the end with the chard leaves. I finished the dish with a little Soyaki from Trader’s Joe’s, and served it over Ramen noodles, minus the spice packet. Don’t judge me — we were out of rice. Market report: Garlic scapes — and kohlrabi, too!